Watch the sunrise over the shores of Lake Chatuge when you escape to this four-bedroom Hiawassee condo, a wonderfully located North Georgia retreat with a private balcony that faces the lake, community access to a shared swimming pool, and easy access to nearby beaches and boat launches. 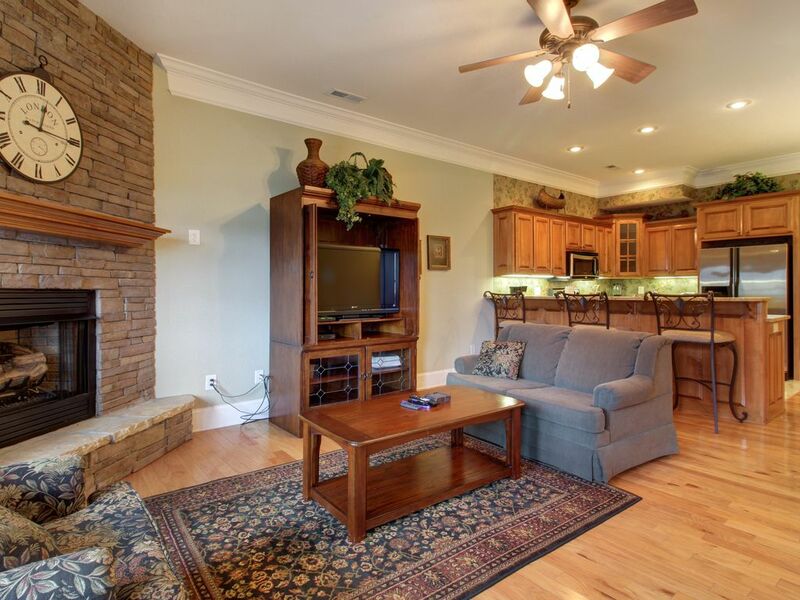 This condo sits one mile south of the North Carolina line, within walking distance of the western shores of Lake Chatuge. Spend long summer days picnicking and sunbathing on the 132-mile lakeshore, swimming and boating at Towns County Recreational Beach & Playground, hiking a portion of the Appalachian Trail, or trout-fishing in the Hiawassee River. Use the kitchen's stainless steel appliances to prepare homemade pancakes and Georgia apple butter each morning, sip your coffee outside in a rocking chair on the balcony, and grab your bathing suit from the washer/dryer for a sunny day out on the water. Return each afternoon for a refreshing dip in the shared community pool, a soothing soak in the jetted bathtub, and a quiet evening in front of the gas fireplace and flatscreen cable TV. You'll never forget the beautiful days you spend on the shores of Lake Chatuge - book your trip to Hiawassee today! Parking Notes: Parking is directly in front of the condo building. This condo was amazing from the start, had everything you could think of included! No issues at all. Thank you for the suggestions! We hope you come again soon. We loved our stay at Lake Chatuge sunrise. The home was beautiful and had everything we needed. We enjoyed the pool, the views, and the home included many very nice finishings. We also enjoyed being close to many different activities and restaurants. We would definitely recommend it! We enjoyed our stay; the home was beautifully finished and had everything we needed. The location was great for all kinds of activities.